For Archives, section 1, click here, section 2, click here, section 3, click here, section 4, click here, section 5, click here, for section 6, click here, section 7, click here, section 8, click here, section 9, click here, section 10, click here and section 11, click here. 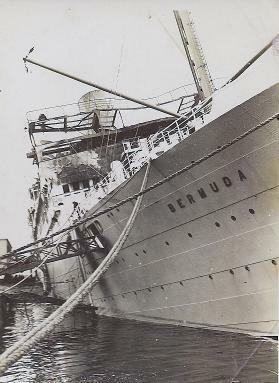 The website has received two separate recollections of troops who travelled in Queen of Bermuda . The first comes from Lesley Lambourne (right), who first noticed the entertainment programme sent to us by Derek Lewis in Archives 7. Turns out that her father may have watched the entertainment. 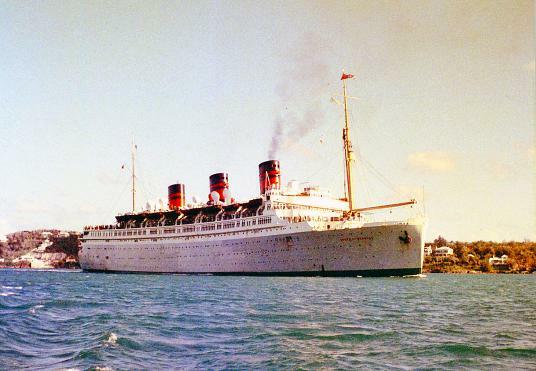 To read about Ken’s impressions of life aboard Queen of Bermuda on that trip, click here. The document has been prepared by Lesley from her father’s memoirs. Copyright belongs to Lesley. Photographs from collection of Lesley Lambourne. 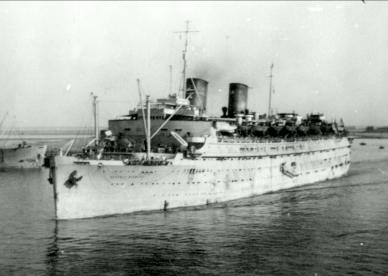 The second recollection records the memorable moment when Monarch of Bermuda passed Queen of Bermuda in the Suez Canal in 1946. ‘On arrival in England, he was met by my mother-to-be, Patricia Aldington, who informed him their wedding was all set for September 14th 1946. Ken and Patricia Kershaw (right) on their wedding day at St. Milburgh's Church in Offenham, near Evesham. We are indebted to Michael Shailer, alias Miguel, former radio officer (right) , for two links to amazing footage of Queen of Bermuda. The first is a unique television recording of Gene Nelson singing and dancing with Pat Horn on board Queen of Bermuda in 1959. The movie was aired on the Pepsi Cola Christmas special that year. To view the film, click here. It has a soundtrack - turn on your speakers. Michael Shailer at the 2009 Grand Reunion. 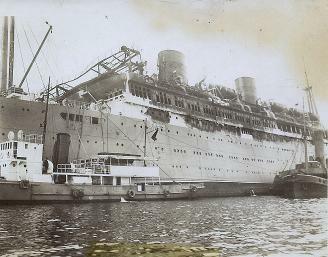 The second clip is of the launch of Queen of Bermuda on 16 September 1932 in Barrow-in-Furness. It is an Italian newsreel film and, although in Italian, the cheers and comments of those watching this momentous event, are clearly heard. David Kellock has sent these three photographs to the website. He says ‘I bought these photos of Bermuda at an antique shop in Cockermouth, Cumbria. They were all together in an envelope but without any details on it or on the reverse of the pictures’. Ted Dyke (left) has contacted the website about his father, Chesley Dyke (below). 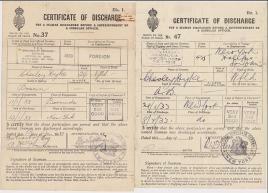 From copies of discharge certificates (see below), he has learned that Chesley sailed with Furness Withy in the 1930s. “My father was born in 1908, on Pool's Island, Newfoundland and got an early start in his career as a cabin boy at the age of nine. 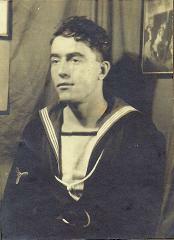 By the age of 20, he had landed a job with Furness Withy & Co. as a seaman on ss Rosalind. On his second trip he was promoted to boatswain . Stephen Card has sent us a transparency he purchased on eBay. 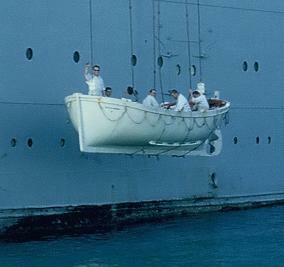 It is of Queen of Bermuda in Hamilton lowering a lifeboat. 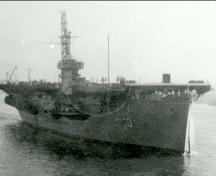 When enlarged, it is possible to identify the faces of her crew for the day. Can you name them? Photograph: collection of Stephen Card.